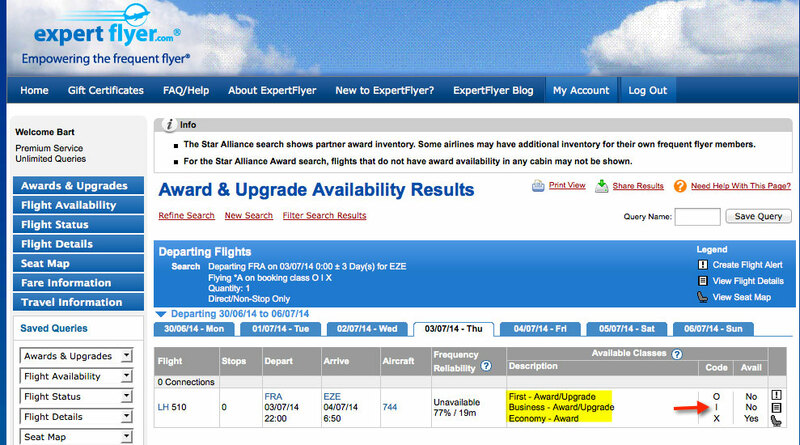 Business Class award availability from Europe to Brazil during the 2014 World Cup is almost non-existing. Being creative with your routing, can provide some alternatives. Flying from Frankfurt to Buenos Aires to Sao Paulo is a great example of an alternative routing. A standard award search on United.com or ExpertFlyer doesn’t show business class availably between Frankfurt and Buenos Aires. However, Lufthansa Miles & More members do have the possibility to book business class awards on flights LH510 and LH511. Add Turkish Airlines fifth freedom flights TK15 and TK16 (Buenos Aires – Sao Paulo) and your itinerary is complete. Surprisingly, Turkish Airlines has plenty of business class award availability on the EZE-GRU segments. I called my Miles & More service center and made a tentative booking BRU-FRA-EZE-GRU-EZE-FRA-BRU with all segments in business class and stopover in EZE. I wanted to make sure the itinerary would price & ticket correctly, and it did. But at 135K miles and 663€ taxes & fees (!!) it didn’t really feel as a great award booking. Adding the fact flights LH510/LH511 between Frankfurt and Buenos Aires would be operated by B747-400 aircraft (high chance of having the old business class cabin), and my initial excitement was gone. Anyway, this was just a first attempt. I’m sure there are more opportunities for alternative routings out there. Do you know them? Please share! Thanks. Hi Bart, Happy to see another person planning an award trip to Brazil for 2014! I just booked my flights from Europe to Brazil for the World Cup. I transferred Starwood points to KrisFlyer and booked the ‘Fifth freedom’ Singapore Airlines flight from Barcelona to Sao Paolo in first (58k miles + 180€). They have decent availability in J still during the World Cup. I also grabbed a flight back on BA first via Sao Paolo to Brussels via London. Avios *should* not charge the high taxes and fees for flights originating in Brazil (90k avios + 2€). There’s not much First availability as of now, but some more dates are open in business. Good luck! TAP, which is based out of Lisbon (LIS) also flies to Brasilia (BSB), Fortaleza (FOR), Belo Horizonte (CNF), Salvador (SSA), Recife (REC) and Porto Alegre (POA) in Brazil. Excellent business class availability from these airports to LIS after 13/07/2014, good for inbound flight. e.g. 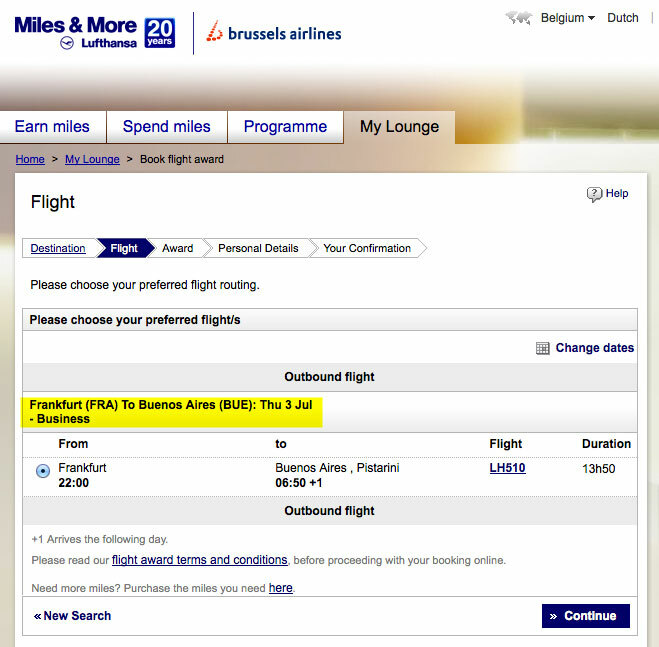 FOR to BRU via LIS on 14/07 = 70K LifeMiles. IMPORTANT: Note that carriers are not allowed to apply fuel surcharges on flights leaving from Brazil. This results in very low additional Taxes & Fees on awards departing from Brazil, even with Lufthansa Miles & More.